Most wheelchairs have a push handle height of only 36” off the ground. For anyone who is average height or above, gripping a wheelchair with such low handles can be a problem. If you (or your spouse) are taller, then you will understand how uncomfortable it can be to stoop over to push a wheelchair. Also, you could be inviting back strain, neck strain and poor posture. Our wheelchair handle extenders will solve this problem. 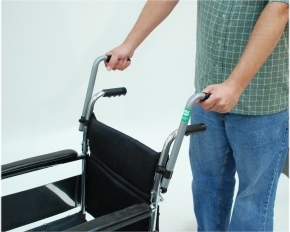 They add up to 203mm (8") of height to a standard-style wheelchair. Easily attach to almost any mobility device and can be quickly adjusted to suit your height...so walking can feel good again. If you have a folding back wheelchair we would recommend the additional clamp set to give added strength to the back rest. If you really want to push the limits of your Handle Extender, you should add these second set of clamps. Having two sets of clamps provides additional stability for going up and down ramps and curbs.